The King has been running the kingdom into the ground lately, so it is time for the Queen to take over. With knights and builders at her disposal she will turn things around and create the Kingdom her people deserve. 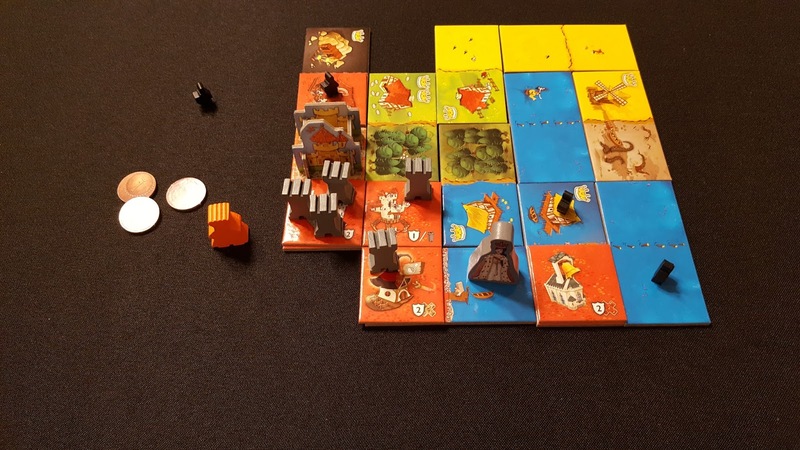 As in Kingdomino, the objective in Queendomino is to choose and place land tiles into your kingdom in the most optimal way matching sides and building large common areas in order to score the most victory points. 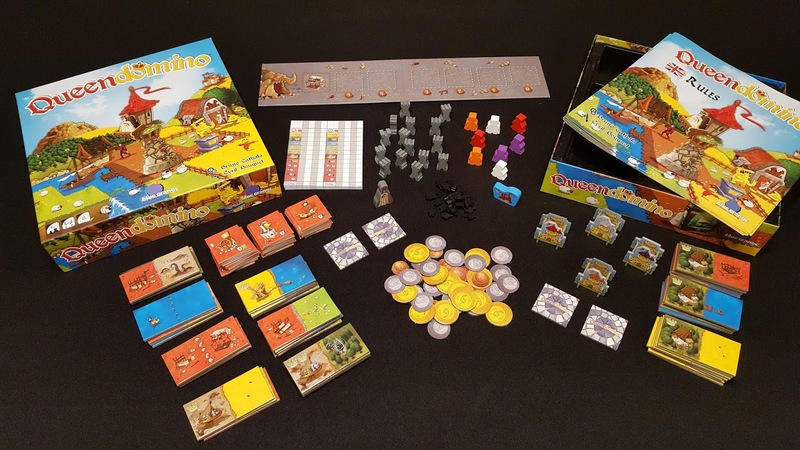 However unlike Kingdomino, Queendomino gives players a few more tools and ways to do this. 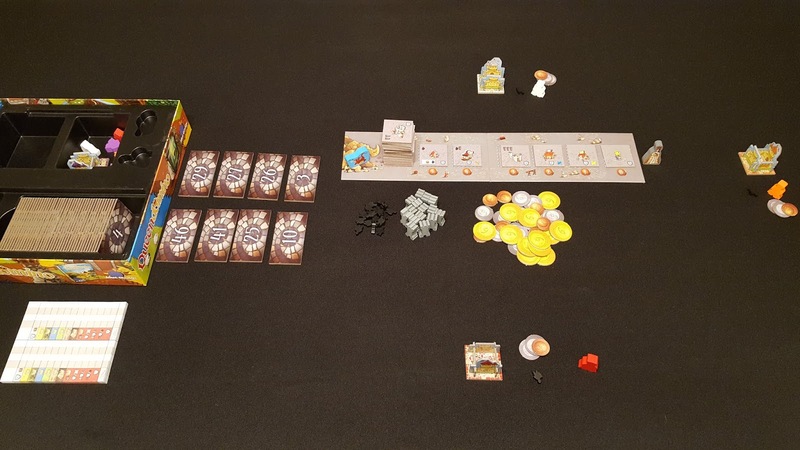 I am not going to spend too much time writing about set up and game play for Queendomino as there are many similarities between it and Kingdomino. If you are not familiar with Kingdomino you can see my review HERE. I will however point out some of the differences as follows. In addition to each player receiving a starting tile, castle, and king token players will receive seven coins and one knight. The main tiles are set up the same by shuffling them and placing them in the box numeric side out. A new board is added to the center of play which holds the new building tiles, dragon and queen. The building tiles are shuffled and six tiles are placed in the market while the remaining tiles are in a stack on the side. The remaining coins, knights, and towers are then placed near the builders board and players are ready to begin. 1) Add the newly chosen tile to her kingdom. This is done in the same manor as it is in Kingdomino. 2) Send one or two knights to collect taxes. 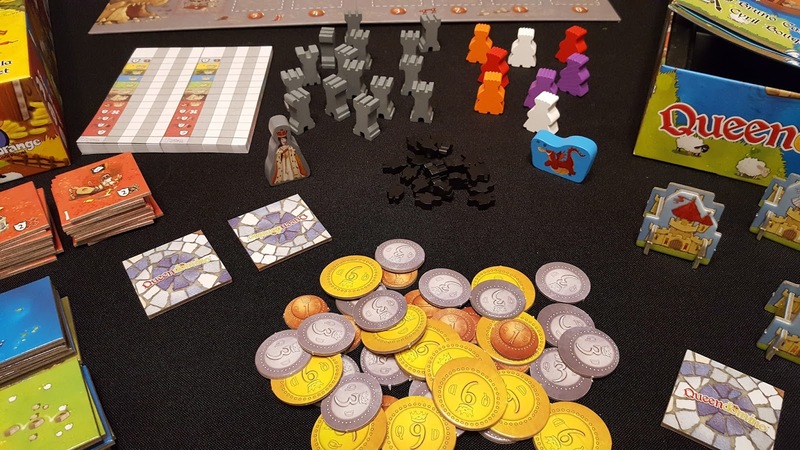 Here the player will place one or two of her knights on the tile she just placed collecting one or two coins per matching territory type. 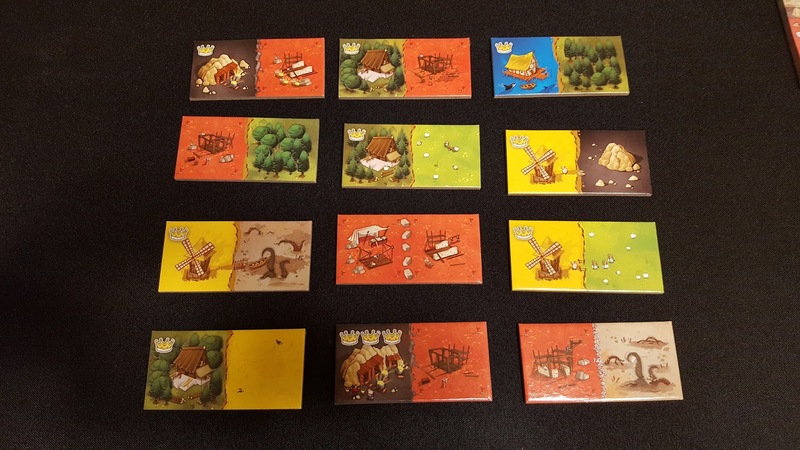 For example the current player has placed a forest/field tile with the field side matching up to a large field territory consisting of five other fields, so she would gain six coins for one knight and 12 coins for two knights. Addendum: Knights must be places on separate side of the tiles. So the player above would not be able to place both knights on the field side collecting 12 coins, only 1 for six. 3) Construct a building. The current player may now purchase and build a building in their Kingdom. Buildings are purchased from the builders board for the amount indicated on the board below the chosen tile. The player then places the building into her kingdom (on one of the empty red building spots) and takes the corresponding action. This might include gaining more knights, towers, or extra taxes on future turns. 4) Bribe the dragon. 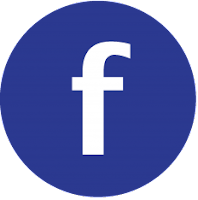 A player may pay the dragon (I.E. bank) one coin to remove any of the buildings on the building board from the game. Only one player per round can do this and only if the Queen is not in their territory. 5) Choose a new tile for next round. This is done in the same manor as in Kingdomino. Note: when players add towers to their kingdoms they check to see if they have the most. 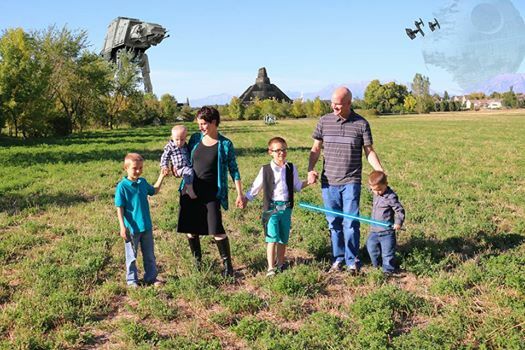 If they do the queen comes and visits their kingdom. Each round she remains in their kingdom, buildings cost one less coin to build. There is also an end of game bonus for having the queen stick around. Three towers and the queen is mine! 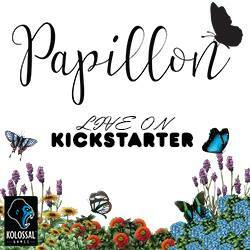 Once each player does the above actions a new set of tiles are drawn and a new round begins. This continues until the last set of tiles are drawn and placed, at which time the game is over and players will tally up their points to see who wins. Final scoring works the same way as Kingdomino by counting up the number of like adjacent territories and multiplying them by the number of crowns in that territory. In addition players will receive points for the coins they have, crowns in the red building territories, and bonuses on the buildings themselves. Also the player who has the queen in their territory at the end of the game will be able to use her as a crown in the territory of their choice. That is it, the player with the most points wins. A finished kingdom. 50 points. Another finished kingdom worth 59 points. My five year-old son's winning kingdom. 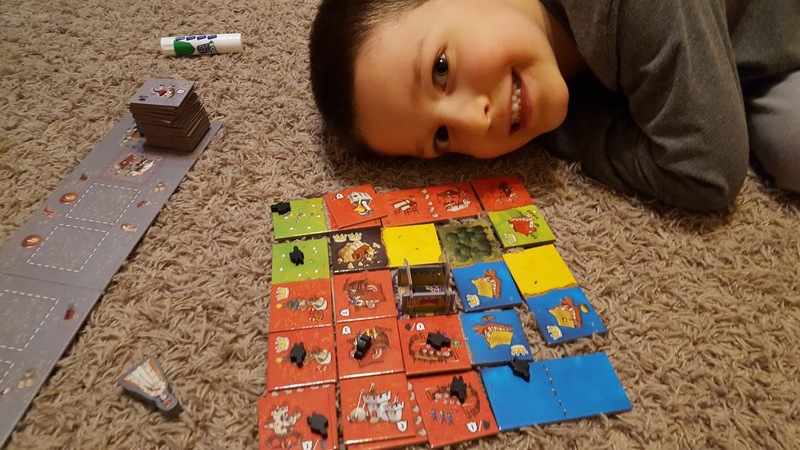 He went for lots of buildings and knights. Looks like it paid off. 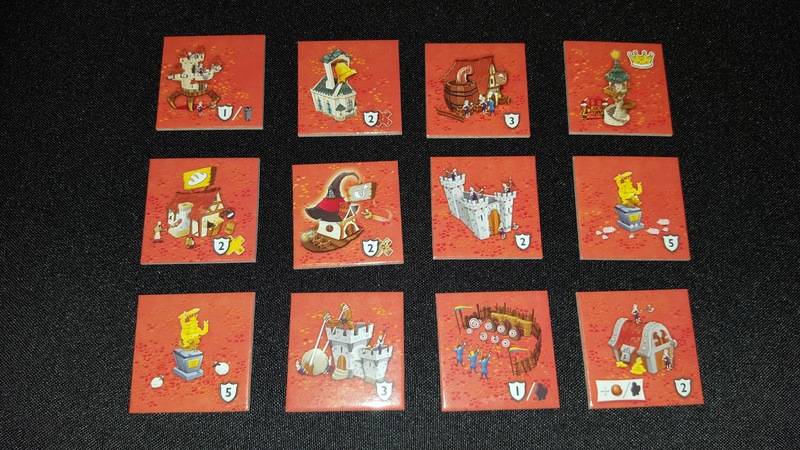 There are also some new variants combining Queendomino with Kingdomino (the "Royal Marriage") to create a 5x5 5-6 player vs player game, 6-8 player team game, and a whopping 7x7 3-4 player vs player game. As a BIG fan of Kingdomino I was pretty skeptical about the release of Queendomino. 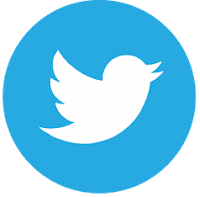 I wasn't sure that the new additions were going to improve game play or worse ruin the simple and elegant game play that already existed. Thank goodness I was wrong. The new additions, in my opinion, add a great deal to the original game play. The mechanics of the market and buildings (with immediate and end of game effects) is a pleasant surprise that adds a lot more choices without amping up the complexity. Players must now manage their resources (coins and knights) and also have many paths to victory. 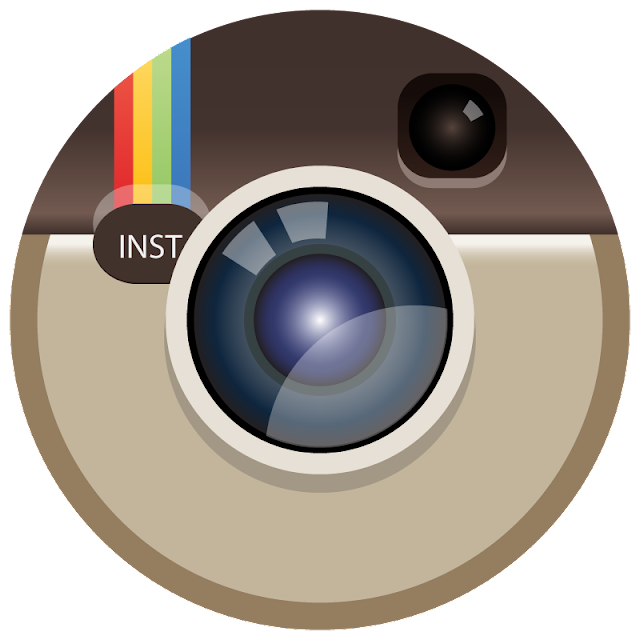 The new game play does add some time to set up, however it is very negligible. And teaching the new rules does not take very long especially if the players have played Kingdomino in the past. 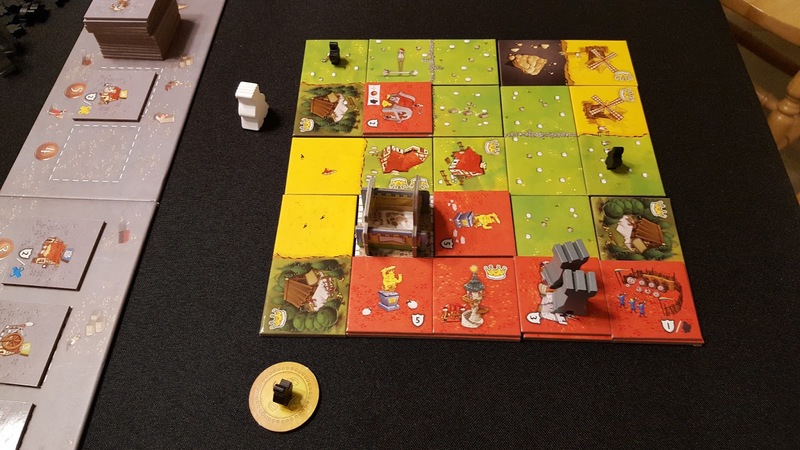 All-in-all the additions also don't cause much extra time to be added to getting a game going which is what I liked about Kingdomino in the first place. Game play is fantastic! 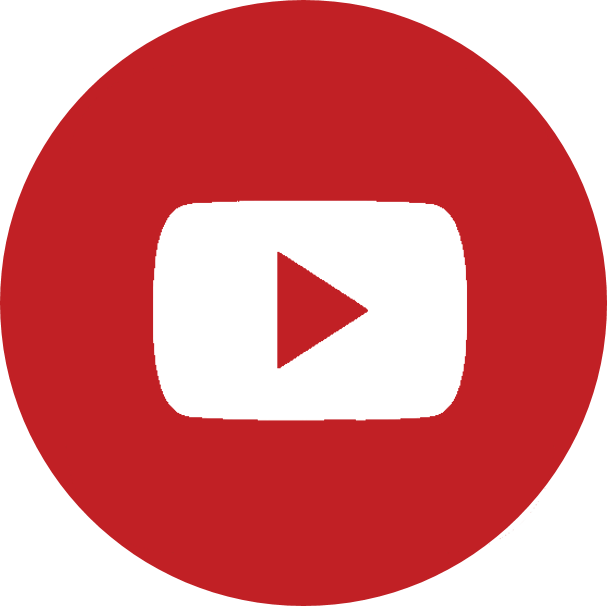 As mentioned above there are many more choices which increase the replay-ability, but this does not add significantly to the length of play. We still found games play quick, around 20-30 minutes tops. A little longer when playing some of the variants. 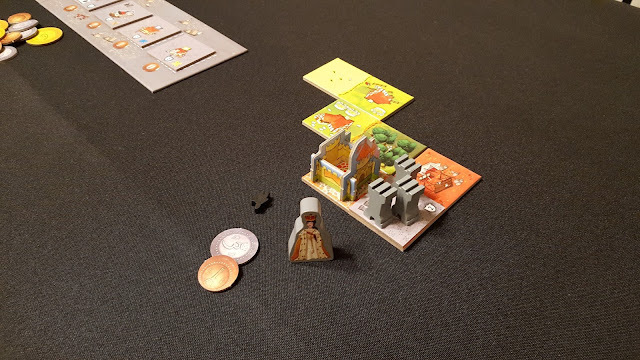 The artwork and components are the same great quality as Kingdomino, with cute cartoon-ish illustrations and many new Easter eggs to be found. I love the addition of the buildings, they bring a lot to the game in way of choices and final scoring. Also managing resources is a great new mechanic that keeps players on their toes. We found that we did not use the dragon very much, if at all. 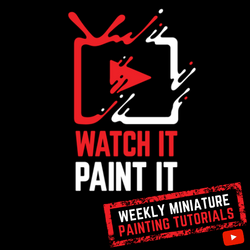 It is a "take that" element which is something we typically steer clear of. And this is picky, but I wish the boxes were the same size. 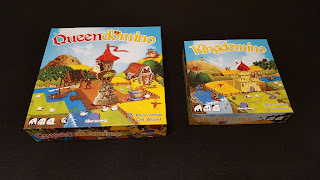 I was so excited to see that what I loved about Kingdomino continues in Queendomino. The quick pace of play and the simple rules combined with the new choices really makes this one another big hit for Blue Orange Games! 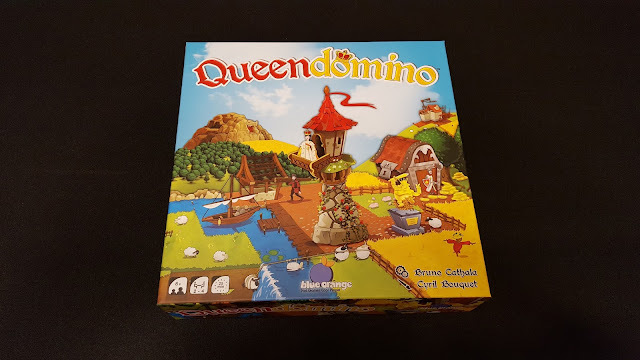 Players who like Kingdomino, Dominoes, Carcassonne, and other tile laying games will love Queendomino!